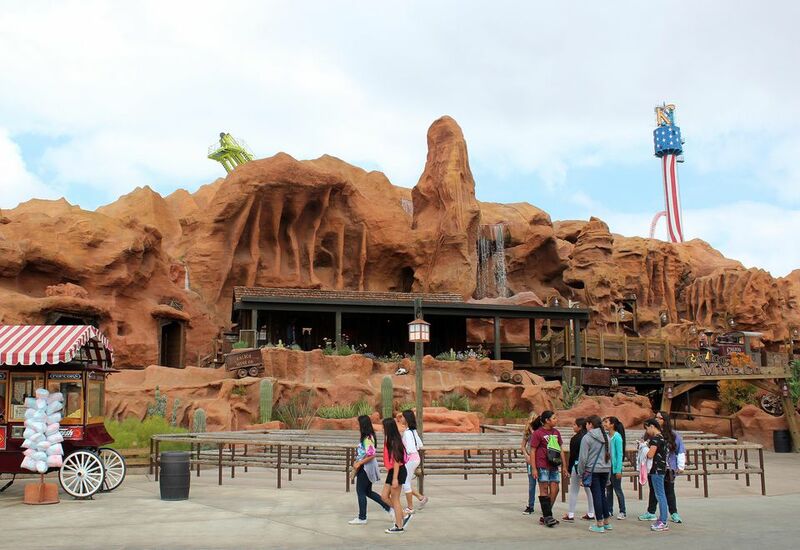 Calico Mine Ride is to Knott's Berry Farm what Pirates of the Caribbean is to Disneyland. It is a grand-scale, engaging, and classic dark ride that is one of the highlights of the park. A 2014 makeover restored it to its former glory and added some wonderful new elements as well. No visit to Knott's would be complete without a trip into the Calico Mine. The ride begins about halfway up the seven-story mountain structure that houses the attraction. Passengers board ore cars pulled by a small locomotive. There are no safety restraints on the cars' bench seats. Despite its name and theme, the Calico Mine Ride is not a mine train coaster, a staple found at many parks. The ride is slow and gentle throughout. While sections of it are quite dark, it does not include any haunted house-like gotchas. All but the most impressionable guests (there are some exaggerated hints at impending explosions) should enjoy the ride. With a ring of a bell and a toot of a horn by the driver, the train enters the mine shaft. A miner welcomes visitors to the 19th century gold mine. He is one of the new animated characters added during the 2014 refresh of the attraction by Garner Holt Productions. The busy ride designer is widely respected for its work and has become a go-to resource for parks seeking animatronic dark ride characters. It restored another one of Knott's classic attractions, the Timber Mountain Log Ride, and has developed new projects for Disney such as The Little Mermaid ~ Ariel's Undersea Adventure. There are some 120 characters incorporated into the nearly eight-minute mine ride, and the Garner Holt team meticulously crafted or restored all of them. The narration can get a bit murky and garbled in the echoey show building. The essential story of the attraction is that visitors are whisked back in time to the Old West days of the Gold Rush to see a working mine operation. The miners are a bunch of cowboy oddballs who tackle the dangerous work in hopes of striking it rich. Along the way, guests travel through dark passageways and encounter geysers, a "Heaven Room" filled with colorful stalagmites and stalactites (accented by an organ crescendo on the soundtrack), miners panning for gold, and a waterfall. Dramatically lit scenes feature vibrant colors that pierce the darkness and stir the senses. One of the highlights of the attraction is the "glory hole" which shows a large crew of miners working to remove ore. The "excavated" space is 65 feet deep and 90 feet wide. Passengers travel past the scene twice during the ride and view the busy proceedings from different perspectives. Near the end of the ride, the train briefly heads outside before reentering the mine shaft. Tension builds as the threat of a mine explosion mounts. An old, bespectacled coot warns passengers to "Remember, one stray spark, and we'll all get blasted to kingdom come." Unfortunately, he says that while sitting on a crate of explosives and holding a tobacco-filled pipe in one hand and a match in the other. The bubbling pots and colorful cave formations recall the Rainbow Caverns Mine Train, which opened in 1956 at Disneyland (and was replaced by Big Thunder Mountain Railroad). It surely influenced Knott's Calico Mine Ride which debuted in 1960. Bud Hurlbut developed and operated the original Calico Mine Ride. He didn't work directly for Knott's, but was an independent concessionaire. The arrangement was not unusual in the early days of theme parks; today, Knott's and virtually all theme parks in North America wholly own and operate all of their attractions. Among the innovations Hurlbut and Knott's brought to parks was the hidden switchback queue. Approaching the Calico Mine Ride, guests typically do not see anybody waiting in line. That's because the queue is located behind the rock work facade. In addition to keeping guests off of the midway and "tricking" them into thinking the wait is short, the queue acclimates them into the story by immersing them in the mine before they board the ride vehicles. Walt Disney was intrigued by the ride's queue, and his Imagineers subsequently incorporated the concept into attractions at Disneyland. By restoring the ride, Knott's is to be commended for recognizing and honoring its legacy. The Calico Mine Ride is, if you'll pardon the pun, a gem of an attraction. It now sparkles brightly for new generations to discover and for old fans to rediscover.